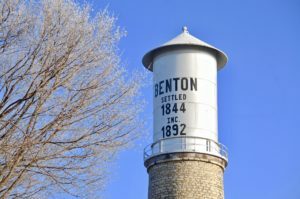 Benton was first inhabited by miners who came up the river from Galena, Illinois—miners who came in the spring and returned to Galena in the fall. These prospectors made no permanent settlements in Benton; they lived in caves dug into the hillsides. Among those first miners were George Rawlins and his son Ashford, who arrived in 1824. The first permanent settlers to Benton were Andrew Murphy, his wife, and five sons. They arrived here in 1827 and settled east of town, near the Horseshoe Bend. They were accompanied by Peter O’Leary, his wife, a French adventurer named Francois, and an old family servant. In 1835, the date of the first federal government land sale, Dennis Murphy (son of Andrew Murphy) purchased land on which Benton now sits. Benton was originally known as “Cottonwood Hill,” named for the large number of cottonwood trees that grew here. In 1845 the name was changed to Benton in honor of Thomas Hart Benton, senator of Missouri and longtime friend of the Murphy family. The town was laid out in March of 1844 and consisted of eight blocks divided by Main, Bean, Catherine, and Jackson (now VanBuren) streets. The history of Benton is notably entwined with that of Father Samuel Mazzuchelli, the highly respected pioneer priest who established 40 parishes and built 25 churches in the area, including Benton’s St. Patrick Catholic Church and New Diggings’ St. Augustine. Father Mazzuchelli, who served St. Patrick for the last 15 years of his life, died in 1864 and is buried in St. Patrick Catholic Church Cemetery. In 1993 Pope John Paul II declared Father Mazzuchelli venerable, the first step to possible canonization as a saint. The Mazzuchelli Gravesite and the Mazzuchelli Rectory Museum stand on the church grounds. Should Father Mazzuchelli become a saint, his gravesite will become a national shrine and will be visited by people around the world. Read the continued chronological history of Benton by following this “Benton History” link.